BIRDMAD: Waxwings finally come South. 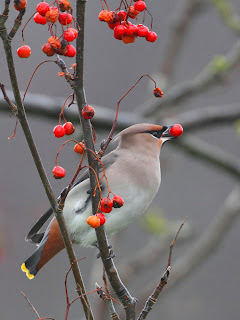 I was becoming increasingly frustrated at seeing reports of hundreds of waxwings in the North. When were they coming down here? David Campbell rang me at about 3:30 PM on Friday afternoon to say that small group had been seen not far from Epsom Downs. I drove over there, but by the time I found the correct spot it was nearly dark and there were no waxwings. David rang again on Saturday morning to say that there were now 11 waxwings. I went straight over and there they were. Over the next 2 hours a number of birdwatchers came and went. Some of the locals came out to ask what we were looking at and they were interested to know that these delightful birds were on their doorstep. It was lovely to see these gorgeous birds again although the light was very poor and it drizzled on and off all day.